The Top 16 came to an end with Round 6 and eight teams advanced to the quarterfinals. 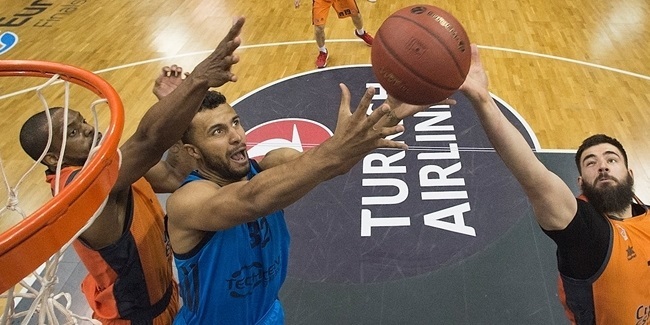 One of the ones that didn't however, ALBA Berlin, managed to end its 7DAYS EuroCup season on a high note with a road win led by Peyton Siva, who earned the MVP honor. ALBA succeeded at Galatasaray Odeabank Istanbul in overtime, 92-97, thanks to Siva and his performance index rating of 26, the highest among winning players this week. Siva scored 19 points - 12 of them in the extra session making it all his team's points in that period -, pulled 5 rebounds, dished 6 assists, collected 3 steals and drew 7 fouls. 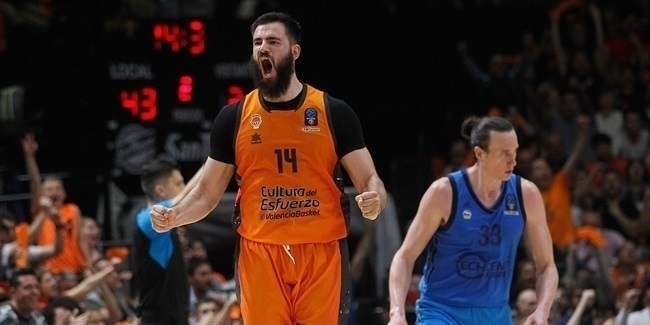 His PIR of 26 helped ALBA reach a collective PIR of 119, the club's highest ever in a road game. Richard Hendrix of Galatasaray had the highest individual PIR this week with 31, but he was not eligible for the honor because his team lost. Hendrix scored 20 points, pulled 13 rebounds and dished 3 assists in a solid performance to put an end to his EuroCup season. The top five performaces of the round were completed with three players with a PIR of 25 apiece: Jared Cunningham of FC Bayern Munich, Goksenin Koksal of Galatasaray and Chris Kramer of Lietuvos Rytas Vilnius. Two players led the scoring charts this round as DJ Seeley of Herbalife Gran Canaria and Cunninghm had 23 points apiece. Amedeo Della Valle of Grissin Bon Reggio Emilia gets to the end of the Top 16 at the top of the scoring rankings (18.6 ppg.). Nobody could get near Hendrix in the paint as he led the rebounds parcel with his 13, matching his career best of a couple of weeks ago. Drew Gordon of Zenit St Petersburg managed to end the phase at the top of the rankings with his 7.7 rebounds per game. Kramer put an end to a dream EuroCup season for him with 10 more steals to top the Round 6 rankings, which led him to end up his participation as assists king with 7.4 decisive passes per night. Suad Sehovic of Buducnost VOLI Podgorica and Jorge Gutierrez of Dolomiti Energia Trento led the steals lists with 4 apiece. Darussafaka Istanbul's Howard Sant-Roos tops the rankings with 2.3 steals per game. Finally, no player stood among the rest under the rim as several players tied for one single block apiece this round. One of them was, of course, Stephane Lasme of UNICS Kazan, who also tops the season rankings (2.5 bpg. ).